We told my family we were pregnant with Baby O while we were all in Mexico together last Christmas. My mom was so excited, she started buying baby gifts right away. 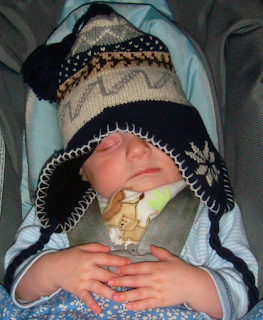 In La Bufadora, Ensenada, Mexico, my mom bought Baby O this hat. How did she know he was going to be a boy? Mother's intuition? So cute! So warm! Thanks Mom! I just had a feeling!